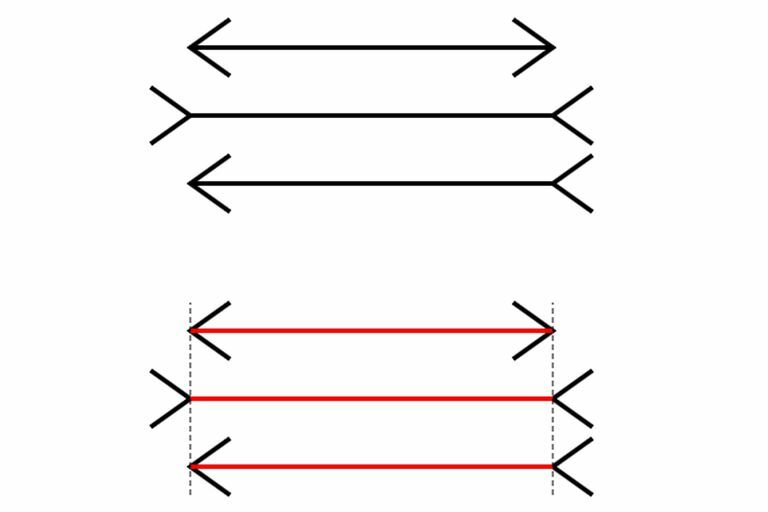 The Muller-Lyer illusion is a well-known optical illusion in which two lines of the same length appear to be of different lengths. The illusion was first created by a German psychologist named Franz Carl Muller-Lyer in 1889. In the image above, which line appears the longest? For most people, the line with the fins of the arrow protruding outward appears to be the longest while the line with the arrow fins pointing inwards appears shorter. While your eyes might tell you that line in the middle is the longest, the shafts of both lines are exactly the same length. First discovered in 1889 by F.C. Muller-Lyer, the illusion has become the subject of considerable interest and different theories have emerged to explain the phenomenon. Optical illusions can be fun and interesting but they also serve as an important tool for researchers. By looking at how we perceive these illusions, we can learn more about how the brain and perceptual process work. However, experts do not always agree on exactly what causes optical illusions, as is the case with the Muller-Lyer illusion. According to psychologist Richard Gregory, this illusion occurs because of a misapplication of size constancy scaling. In most cases, size constancy allows us to perceive objects in a stable way by taking distance into account. In the three-dimensional world, this principle allows us to perceive a tall person as tall whether they are standing next to us or off in the distance. When we apply this same principle to two-dimensional objects, Gregory suggests, errors can result. Other researchers contend that Gregory's explanation does not sufficiently explain this illusion. For example, other versions of the Muller-Lyer illusion utilize two circles at the end of the shaft. While there are no depth cues, the illusion still occurs. It has also been demonstrated that the illusion can even occur when viewing three-dimensional objects. Depth plays an important role in our ability to judge distance. One explanation of the Muller-Lyer illusion is that our brains perceive the depths of the two shafts based upon depth cues. When the fins are pointing in toward the shaft of the line, we perceive it as sloping away much like the corner of a building. This depth cue leads us to see that line as further away and therefore shorter. When the fins are pointing outward away from the line, it looks more like the corner of a room sloping toward the viewer. This depth cue leads us to believe that this line is closer and therefore longer. An alternative explanation proposed by R. H. Day suggests that the Muller-Lyer illusion occurs because of conflicting cues. Our ability to perceive the length of the lines depends on the actual length of the line itself and the overall length of the figure. Since the total length of one figure is longer than the length of the lines themselves, it causes the line with the outward facing fins to be seen as longer. Researchers from the University of London suggest that the illusion demonstrates how the brain reflexively judges information about length and size before anything else. "Many visual illusions might be so effective because they tap into how the human brain reflexively processes information. If an illusion can capture attention in this way, then this suggests that the brain processes these visual clues rapidly and unconsciously. This also suggests that perhaps optical illusions represent what our brains like to see," explained researcher Dr. Michael Proulx. Day. R. H. (1989). Natural and Artificial Cutes, Perceptual Compromise and the Basis of Verdical and Illusory Perception. In D. Vickers & P. L. Smith (Eds. ), Human Information Processing: Measures and Mechanisms. North Holland, The Netherlands: Elsevier Science. DeLucia, P., & Hochberg, J. (1991). Geometrical Illusions in Solid Objects Under Ordinary Viewing Conditions. Perception and Psychophysics, 50, 547-554. Gregory, R. L. (1966) Eye and Brain. New York: McGraw-Hill.